Wiring consists of a single line of low-voltage cable. However, zoning is digital, not hardwired, allowing changes to be made in minutes. When the LogiSon® Acoustic Network is installed, neither the timer, keypad, paging nor music zones are hard-wired, because all zones are software-generated. This feature leads to minimal cabling, which ensures efficient installation and a clean appearance in visible applications. 2-conductor cables are available in 5, 18, 25 and 50 foot lengths (1.5, 5.5, 7.6 and 15.2 meters). 6-conductor cables are available in 5, 18, 25, 50 and 100 foot lengths (1.5, 5.5, 7.6, 15.2 and 30.4 meters). Cable couplers are used to connect two cable assemblies together when additional lengths are required. They are available in both 2- (CC2) and 6-conductor (CC6) sizes. 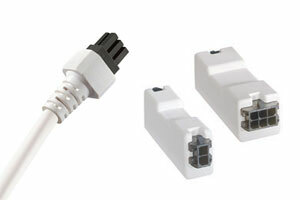 Cable assemblies and cable couplers are available in white or charcoal grey. A single line of plenum-rated, low-voltage cable connects the components, carrying power, control and audio signals across the LogiSon Acoustic Network. Cabling connections are marked with embossed icons on the hubs. All cable assemblies and cable couplers feature micro-connectors that simply snap together, enabling quick, accurate and tidy installation. Positive-locking mechanisms prevent accidental disconnection.